Foodprint LA is the fourth in a series of international conversations about food and the city. With LA’s pioneering Food Policy Council approaching its second birthday, the timing is perfect for a truly cross-disciplinary discussion that explores the past, present, and future of food and the city. From ghost orchards to taco trucks, and from the city’s century-old water grab to the eviction of South Central Farm, Foodprint LA panelists will explore the forces that have shaped the Angeleno foodscape and speculate on how to feed LA in the future. 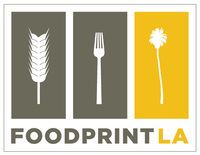 We’re thrilled to be bringing the Foodprint Project to Los Angeles on December 9, 2012, where it will be generously hosted by the Los Angeles County Museum of Art. For the first time, we’re planning two additional events, to be held on Saturday, December 8. We’ll be partnering with Los Angeles’ most dedicated pedestrian, design writer Alissa Walker, to lead a walking tour through the Arts and Produce District, followed by a VIP cocktail party. We hope you’ll join us! Time: 12:30 p.m. to 5 p.m.
How do zoning, policy, and economics shape LA’s food systems? Hadley Arnold is Co-Director of the Arid Lands Institute at Woodbury University, an education, research, and outreach center that uses design to address issues of water scarcity in the American West. Nate Berg (@nate_berg) is a journalist covering cities, science and design. Previously he was a staff writer at The Atlantic Cities and an editor at Planetizen. He lives in Los Angeles and enjoys sunflower seeds. Dr. Deborah A. Cohen is a researcher in the area of the built environment and health, and is co-author of Prescription for a Healthy Nation: A New Approach to Improving our Lives by Fixing our Everyday World. She is a senior natural scientist at the RAND Corporation. For more than a decade her research studies have been focused in on the role of the built environment in physical activity and dietary behaviors. Paula Daniels is Senior Adviser on Food Policy and Special Water Projects to Mayor Villaraigosa. She is the founder of the Los Angeles Food Policy Council, a collective impact initiative of over 100 active food system experts and leaders engaged in advancing the Good Food for All agenda. Rudy Espinoza is an urban planner who specializes in identifying investment opportunities in low-income communities, building private/nonprofit partnerships, and training the working poor to build assets. He currently works at Community Financial Resource Center in South LA where he leads an initiative providing business assistance and micro-loans to street vendors. He serves on the Board of Leadership for Urban Renewal Now, the Advisory Board of the LA Development Fund, and on the Los Angeles Human Relations Commission. 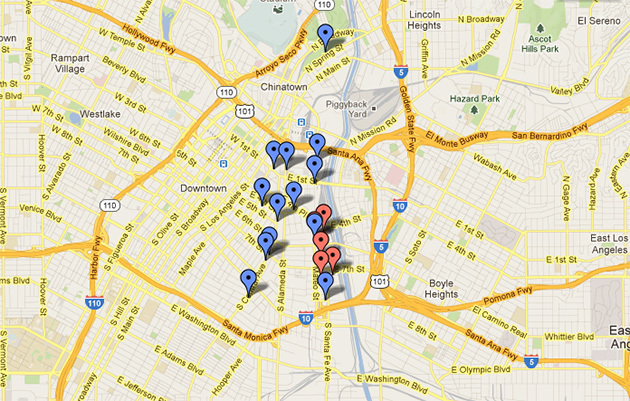 What can we learn when we map Los Angeles using food as the metric? Jonathan Gold (@thejgold) is a food critic who currently writes for the Los Angeles Times and used to write for LA Weekly and Gourmet. In 2007, he became the first food critic to win the Pulitzer Prize. He is also a regular contributor to KCRW’s Good Food radio program. Mary Lee is Deputy Director of the Center for Health Equity and Place at PolicyLink, providing research, technical assistance and training to public and private agencies collaborating to build healthy communities. She is a practicing attorney with more than 25 years of experience in civil rights, land use, economic and neighborhood development strategies and civic democracy. Her areas of expertise include the impact of the built environment on health, health disparities in low-income communities, and food deserts. Benjamin Stokes (@bgstokes) investigates real-world games and participatory mapping, most recently in South Los Angeles. Benjamin is a co-founder of Games for Change, the nonprofit movement to use games for social impact. Previously, he was a MacArthur Foundation program officer in the portfolio on Digital Media and Learning. Benjamin is currently completing his PhD at the USC Annenberg School for Communication & Journalism. Teague Weybright is the current Board President of the Los Angeles Community Garden Council, which serves dozens of Community Gardens throughout Los Angeles County. His time is also spent at various school gardens, teaching urban agriculture to students, as well as developing urban farms with Farmworks LA. How has today’s food culture in Los Angeles been shaped by social changes, economic fluctuations, and technological innovations throughout the city’s history? Gustavo Arellano (@GustavoArellano) is the editor of OC Weekly, an alternative newspaper in Orange County, California, author of Orange County: A Personal History and Taco USA: How Mexican Food Conquered America, and lecturer with the Chicana and Chicano Studies department at California State University, Fullerton. He writes “¡Ask a Mexican!,” a nationally syndicated column in which he answers any and all questions about America’s spiciest and largest minority. Willy Blackmore (@willyblackmore) is the Los Angeles editor of Tasting Table, a daily email publication covering food and drink culture. He has also written about food, art, and agriculture for such publications as Los Angeles Magazine, The Awl, GOOD, LA Weekly, The New Inquiry, and BlackBook. Judith Gerber (@LAfarmgirl) is a freelance writer who regularly writes about sustainable and urban farming, local foods, and organic gardening and has been a Healthy & Green Living Contributor for the website Care2.com for the past three years. Her book Farming in Torrance and the South Bay was released in September 2008. She is a volunteer at her local farmers’ market and a University of California Certified Master Gardener. She created the Torrance Memorial Medical Center Gardening Program in 2009 and is the hospital’s Garden Program Coordinator. Matt Novak (@paleofuture) writes the Paleofuture blog for Smithsonian magazine, The Paleofuturist column for the BBC, and the Retrofuturism column for The Daily. He also writes about old inventions for Pacific Standard. Matt has written for Slate, The Verge, GOOD, Wall Street Journal, TheAtlantic.com, FWD and is the editor of Paleofuture Magazine, the first issue of which was all about food. Jessica Rath is an artist whose latest project, take me to the apple breeder, is a set of nine sculptures based on apple varieties held at Cornell University’s Plant Genetics Resource Unit. Her work investigates points at which human intervention has changed the course of the natural world, in order to question the naturalist’s, artist’s and scientist’s drive to design and control beauty within the landscape. What are the opportunities and challenges of LA’s possible food futures? Christina Agapakis (@thisischristina) is a synthetic biologist at UCLA interested in the structure, evolution and design of the microbial communities that help us to produce and digest our food. Her research is collaborative and multidisciplinary, working with engineers, artists, and designers and ranging from the ecology of soil to skin to cheese. Her blog, Oscillator, is hosted by Scientific American. Allison Carruth (@AllisonCarruth) is an Assistant Professor of English at UCLA, where she is affiliated with the Institute of the Environment and Sustainability and the Center for the Study of Women. Her areas of research include contemporary fiction and new media, food studies, and art-science collaboration around environmental challenges. Her first book, entitled Global Appetites: American Power and the Literature of Food, is forthcoming from Cambridge University Press. She is also co-editor of the project Prototyping Futures/Occupying the Present, book review editor of Gastronomica: The Journal of Food and Culture, and media editor of the new journal Resilience: A Journal of the Environmental Humanities. Erik Cutter (@enviroingenuity) is the Managing Director of Alegría Fresh, a new start-up in Laguna Beach, which utilizes high-efficiency hydroponic vertical farming systems to produce and distribute superior, locally grown salad greens and vegetables. Mr. Cutter has over 35 years experience growing food using organic techniques and has a background in Biochemistry and Oncology. The company’s goals include connecting individuals with their food, influencing positive change in resource management, developing healthy eating habits and creating jobs in urban agriculture. Joseph Wickham is a founder of Robotic Harvesting LLC, which was inspired by the DARPA Grand Challenge, the competition for driverless cars. With the help of university researchers, the firm developed a highly intelligent, self-navigating robotic harvester capable of automatically picking strawberries. Joseph has held senior positions at Hitachi and Intel, and currently serves as Chief Financial Officer of the Petersen Automotive Museum. Coverage of the critiques, pinups, lectures, and events hosted by the Arid Lands Institute. Its an inside look at the events you could not make it to and a peek at works in progress.